Focused on the intersection of law and information security. When I was a penetration tester I struggled to adequately express the importance of the vulnerabilities I identified. For some reason, I couldn’t convince the business and legal teams that the vulnerabilities had to be mitigated and that the business had to spend time and money on the effort. It turns out it wasn’t their failure, but mine. I wasn’t speaking in the right language. I dropped out of the security world for three years and went to law school. When I enrolled, my goal was not to become a lawyer, but to learn to think and write like a lawyer. I enjoyed law school and took full advantage of the opportunities presented to me. I was able to work as a research assistant for one of the legal research and writing professors (Thanks Mike! ), serve on the editorial board of the Law Journal, earned a fellowship in the Center for Terrorism Law, and leveraged my IT skills to get a job in the Westlaw lab. I really enjoyed law school. After law school I returned to security, this time with a different language under my belt and a better understanding of how to present my concerns. I couldn’t think in terms of security vulnerabilities anymore. I had to speak another language. While they sound similar, they are distinct ways of approaching a decision. In order to communicate the importance of security to different audiences, I had to adapt to them and not expect them to adapt to me. So need additional funding for a security project? Write up your proposals geared toward the audience and how they think. Does the lack of a security control create risk to the organization? Will the organization breach a duty and become liable under a contract, law, or regulation? These subtle shifts in thinking may help drive the discussion forward and lead to better understanding and better security. This entry was posted in Blog, cybersecurity, Information Security on September 27, 2017 by Eddie Block. Since the Equifax breach a screenshot of the CSO’s music degrees has been floating around the Internet. As a Classical Civilizations undergrad, I take issue with the implications. During college I built networks and databases and worked on systems of all types. I also spent my summers on archaeological sites in Israel. After graduating from college, I worked helpdesk support, moved into system administration, started securing systems and networks. I eventually became a full time pentester. Midcareer, I dropped out of InfoSec and went to law school. After law school I went back into security doing product security, working with DoD networks, and securing a $20 billion enterprise. I eventually served as the Chief Information Security Officer for the State of Texas. So I was the CISO for a state of 28 million people with degrees in Classical Civilizations and Law. Does that make me unqualified for my job? Should I have stuck with my life in archaeology? I know a loooottttttt of people in InfoSec with no or unrelated degrees. In fact there was almost no university offering a security degree when I or my friends were in college. What makes a security person? Curiosity. Grab all the degrees and certifications you want, without a natural curiosity of how things work (and more importantly break) you won’t make it in InfoSec. Making things work in unintended ways is the fundamental tenant of security. The most important word in InfoSec is “Huh?”. 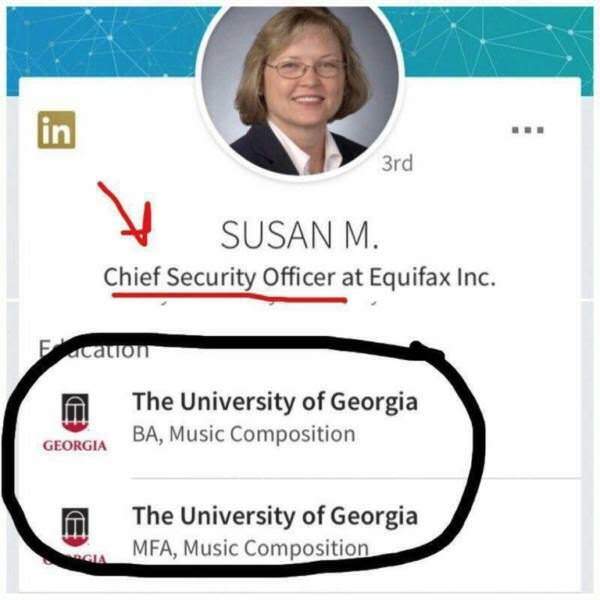 So was Ms. Mauldin qualified to lead Equifax’s security program? I don’t know, but I won’t make that judgment base of her degrees. This entry was posted in Blog, cybersecurity, Information Security on September 20, 2017 by Eddie Block. Does data protection still matter? Yesterday Equifax (you know the folks that sell credit monitoring services) announced that they were breached. 143 million Americans (or 44% of all Americans) had their personal information exposed. The 143 million Americans exposed by Equifax, the 22 million exposed in the 2015 OPM breach, the 1.5 billion records exposed by Yahoo would seem to indicate that there is no data left to breach. The chickens are out of the henhouse. So where do we go now? Security is a series of layers. Physical protection, perimeter protection, system protection… Preventative, detective, and corrective controls… Compensating controls for when any of those fail. Security is hard. It is easier to tear something down than to build something up. The time I spent breaking into systems and networks was a lot easier (and more fun) than the time I spent trying to protect them. So do the victims get a free pass? No! Because they aren’t the victims, we are. The information that is lost is ours. We entrust our personal information to these companies – in the case of Equifax and the other credit reporting companies we don’t have much say in the matter. They have a duty to protect our information from the threats we know are out there. They need to do the hard work. Hey, the good news is that Equifax is offering credit monitoring services for the people affected by the breach of their own systems. That certainly makes me feel more secure. This entry was posted in Blog, cybersecurity, Information Security, Privacy on September 8, 2017 by Eddie Block. Interested in liability protections? Learn about the Safety Act. The “Support Anti-terrorism by Fostering Effective Technologies Act of 2002 or Safety Act (no, I don’t know where the “Y” came from) seems to have flown under the radar for the past 15 years with few buyers or sellers of cybersecurity technologies taking advantage of the Act and its liability protections. Passed in the wake of the terrorists attacks on September 11, 2001, the Act’s stated intent is to incentivize the development and deployment of Qualified Anti-Terrorism Technologies (QATT), including cybersecurity technologies, in a couple very specific ways. First, the Act limits the Seller of a QATT’s financial liability to an amount determined by the Office of SAFETY Act within the Department of Homeland Security. In exchange for carrying the required insurance, the seller’s liability is limited to the amount of that insurance (6 CFR Part §25.7(a)). Additionally, no punitive, exemplary (§25.7(b)(1)), or noneconomic damages, “unless the plaintiff suffered physical harm” are available to the plaintiff (§25.7(b)(2)). So putting it all together, any cause of action resulting from an Act of Terrorism regarding a QATT has exclusive federal jurisdiction, has a cap to awards, cannot include punitive, exemplary, or noneconomic (with exceptions) damages, and can only be brought against the Seller, not their subcontractors, suppliers or buyers. uses methods designed or intended to cause mass destruction. There is no requirement that the Act of Terrorism have a political basis. Many attacks against public and private sector enterprises could fall under this umbrella. Of course, this is a very high-level overview of a 10 page regulation, but with so many benefits for themselves and their customers, companies are tripping over themselves to get to the Office of Safety Act right? Actually, according to the Approved Awards Search site only around a dozen companies have earned awards for cybersecurity related technologies. In a world where over 300 vendors exhibited at the most recent BlackHat conference, it would seem that the ability to offer your customers any level of liability protection would make a great differentiator. This entry was posted in Blog, cybersecurity, Federal Law, Information Security on August 10, 2017 by Eddie Block. The JurisHacker blog is published by Eddie Block of Foley Gardere for educational purposes only and does not reflect the views or opinions of Foley Gardere. Does ‘data’ only mean electronic data? When is a fraud a “direct” result of computer use?